Germany's greatest ever ski jumper Jens Weissflog survived injuries and style changes for a long medal filled career that spanned a twelve-year period between the mid 1980s and the mid 1990s and featured three Olympic titles. The East German, nicknamed "the Flea" because he measured only 1.70m, was already leaping beyond 50m by the time he was 12, and it was no surprise that this first class jumper won his fourth and final Four Hills title in his retirement year in 1996. He began his career in the town of Spartakiade in 1977, and was soon producing surprisingly long jumps, not least the 113m leap at Oberhof which he achieved when he was just 15. The start of Weissflog's career could not have been more spectacular. 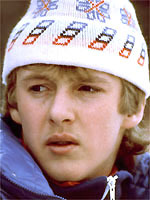 At the Four Hills tournament in 1983 the short kid, who most competitors thought was there to get their autographs, soared to victory in the fourth stage at Bischofshofen. This was not only Weissflog's first World Cup win; it earned him a sensational second place in the tournament behind the Finn, Matti Nykanen. Brilliant throughout the 1984-85 season, topped with an Olympic title in Sarajevo, Weissflog then experienced a dip in form which lasted rather too long for comfort. He shook himself awake for the 1988-89 season, though, taking second place in the Four Hills, the world championship title and an an overall World Cup title. Two knee operations in 1990 and 1991 knocked him right off his stride again, and his absence from the circuit crucially coincided with the introduction of the revolutionary "V" shape technique in flight. Most jumpers had got to grips with the style by the time the Albertville Games came around in 1992 and although Weissflog took part, he was never in with a chance. At Lillehammer in 1994, the story was much different where he not only caught up with the pack, he sailed past them winning two gold medals in the large hill and team events. Despite creeping into the late autumn of his career, Weissflog enjoyed one last success-filled season in 1995-96, ending with a fourth and final Four Hills triumph. A former member of the East German People's Chamber (East Germany's Parliament) and the darling of the East German establishment, Weissflog was criticised for his loyalty to the communist system. Married with one son, he now works as a commentator with a German television station and owns a hotel in his hometown.